The book’s nineteen content chapters range from 15 to 35 pages in length and provide cutting-edge historical interpretations. No other resource so closely follows California’s new History-Social Science Framework for Grade 8 United States history. Each chapter starts with a pre-reading advanced organizer. It begins with the California learning standards covered in the chapter. This is followed by a series of Essential Questions and a list of important terms and names that students should know. Next comes Golden State “Nuggets” of Knowledge—a one-page summary of the most important ideas and facts found in the chapter. Students can also later refer to this page. Together, these four features serve as an essential advanced organizer for the rest of the chapter. This is followed by the main text of the chapter itself. Written in clear and concise language that students can easily grasp, each chapter illuminates a particular period of American history with a compelling narrative. The text is highly chunked and closely follows the new History-Social Science Framework. The text is accompanied by engaging maps, diagrams, charts, and contemporary illustrations. Students are asked to engage in various activities in “The Historian’s Apprentice” found at the end of each major section of text. They may be asked to apply what they have just learned through role-play—such as describing conditions on the Great Plains in a letter to a relative back East or in Europe, or by reenacting the impeachment of Andrew Johnson in their classroom. They may be asked to interpret a primary document—like Dr. Martin Luther King Jr.’s “I Have a Dream” Speech—or to research a topic for additional information—such as the life of a famous inventor or entrepreneur and the relationship of major life events to that inventor’s accomplishments. The variety of these activities encourages differentiated instruction. Finally, each chapter ends with a concept map and a series of practice test questions based on California’s learning standards for United States history. Assessment items include a variety of multiple-choice, short answer and essay questions. In addition to the basic text, the program includes a PDF for teachers containing 100 pages of printable handouts (“Black Line Masters”) for student use. These include outline maps, graphic organizers for students to complete, and additional primary source readings accompanied by questions. Several of these handouts are devoted to social studies skills, such as constructing timelines or identifying relevant information. A special Teacher’s Guide is available as a PDF without charge for teachers ordering at least 30 copies of E Pluribus Unum. The Guide begins with a section of general instructional strategies used by teachers in today’s social studies classrooms, such as RAFT, OPTICS, and sensory figure analysis. This section may be especially useful for new teachers. The rest of the Teacher’s Guide consists of chapter-by-chapter resources to assist in lesson planning. Each chapter begins with the content standards and sections of the new History-Social Science Framework covered in the chapter. This is followed by additional guiding questions for the chapter, a series of suggested lesson activities for teaching the chapter, a generic performance-based scoring rubric, and a list of website addresses with free online resources for the chapter. Next comes a reference materials section that contains images, maps and documents from the chapter for classroom projection. Finally, there is a copy of the chapter concept map and a concept map with blank spaces for students to complete. An answer key for all of the multiple-choice questions in the book is found at the end of the Teacher’s Guide. Printable unit assessments are also included in the package for those districts adopting E Pluribus Unum. The online version of E Pluribus Unum provides text in the center screen and special features, including a brief introductory video, an auditory file of the chapter and chapter review cards, in a separate screen to the right. Students are able to highlight and annotate their online copies and keep their own individual annotations. E Pluribus Unum has a story to tell—the story of the gradual expansion of our democracy. It also provides 100 carefully selected excerpts from primary sources, accompanied by questions for students. 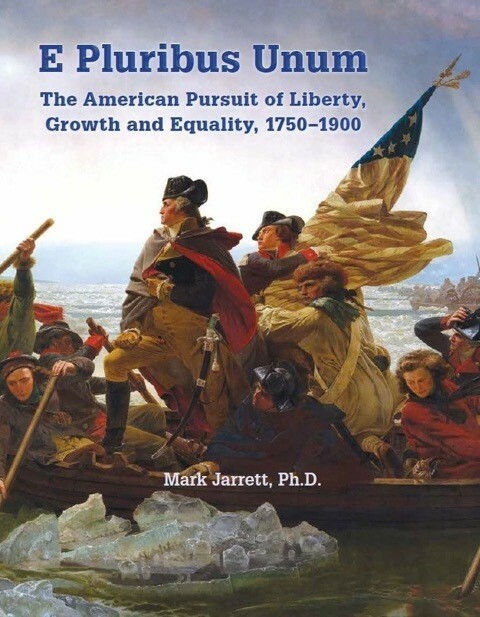 This introduction explains how historians obtain their information about the past from primary and secondary sources and identifies the three major themes of E Pluribus Unum—liberty, growth and equality.This introduction explains how historians obtain their information about the past from primary and secondary sources and identifies the three major themes of E Pluribus Unum—liberty, growth and equality. Students learn how the voyages of Christopher Columbus and other European explorers brought two worlds together—the Eastern and Western Hemispheres. Then they learn how religious conflicts and the doctrine of mercantilism spurred Western European rulers to make claims to parts of North America and led Spain, France and the Netherlands to establish colonies there. Students next learn how England established its first colonies in North America and how New England, the Middle colonies and the Southern colonies differed. Students explore the contributions of key groups to colonial life, the origins and characteristics of the Atlantic slave trade, how the colonies were governed, the growth of religious toleration in the colonies, and the effects of the Great Awakening. Students learn about the causes and course of the French and Indian War, including the role played by George Washington. Then they learn how the Proclamation Line of 1763 and British attempts to tax the colonies in the aftermath of the French and Indian War led to increasing disagreements between the colonists and the British government. Students are also introduced to John Locke’s views of the social contract and other Enlightenment ideas. Students learn how armed conflict between the British and the colonists broke out in Massachusetts in 1775, how the Second Continental Congress created the Continental Army and appointed George Washington as its commander, how the colonists declared their independence, and how the colonists won the Revolutionary War. Maps illuminate the chief campaigns. Students further learn about the experiences of different groups during the Revolutionary War, and how the American Revolution affected other nations. Students learn how delegates from the different states met in Philadelphia in May 1787 to revise the Articles of Confederation but wrote a whole new Constitution instead. They learn about the compromises at the Constitutional Convention, the structure of the new federal government, three of the core principles of our Constitution (the separation of powers, checks and balances, and federalism), the debate over ratification, and the Bill of Rights. They also look squarely at the issue of slavery at the Constitutional Convention. Students learn about the administration of our first President, George Washington, and how his actions created precedents for later Presidents. They learn about the first Cabinet, Hamilton’s financial plan, the rise of the first political parties, the impact of the French Revolution on American political parties, and President Washington’s “Farewell Address.” They also examine the treaties concluded between the federal government and various America Indian tribes and consider how these were later violated or discarded. Students learn about the disagreements between Federalists and Democratic-Republicans during the Presidencies of John Adams and Thomas Jefferson—including the “XYZ” Affair, the “Quasi-War,” the Alien and Sedition Acts, the Kentucky and Virginia Resolutions, the “Revolution of 1800,” the Louisiana Purchase, the Supreme Court decision of Marbury v. Madison, and the Embargo of 1807. Special emphasis is placed on Jefferson’s views respecting the constitutionality of the Louisiana Purchase. Students learn about the physical landscape of the early American Republic and how it changed as a consequence of human settlement. Then they learn about the daily lives of American farmers, craftsmen, and merchants. Students learn that a “Market Revolution” occurred during this period, in which more and more Americans began buying and selling goods on an open “market.” Students also learn about the importance of contract rights in the seminal cases of Fletcher v. Peck and Dartmouth College v. Woodward. They examine the experiences of free African Americans, American Jews, and women. Students also learn about the experiences of gay, lesbian and bisexual Americans in this period. Finally, they look at American education and culture in these years, including different views on the purposes of American public education. Students learn about the causes, course and consequences of the War of 1812. Then they learn about the collapse of the Federalist Party and the subsequent “Era of Good Feelings,” including the Tariff of 1816, the chartering of the Second Bank of the United States, Henry Clay’s “American System,” the annexation of Florida, the Missouri Compromise, and the Monroe Doctrine. Students learn about the Presidency of Andrew Jackson, including his election in 1828, the end of property qualifications and rise of “Jacksonian Democracy,” Jackson’s rotation of office-holders (or “spoils system”), the Indian Removal Act, the Cherokee “Trail of Tears,” Jackson’s “War” on the Bank, and the Nullification Crisis. In the early nineteenth century, the Northeast emerged as the industrial center of the United States. Students learn about the Industrial Revolution in Britain and how Samuel Slater and Francis Cabot Lowell established textile mills in New England using new industrial machinery. Students also learn about the “Transportation Revolution,” including turnpikes, canals, steamboats, trains and the telegraph. They learn that in the case of Gibbons v. Ogden, the U.S. Supreme Court expanded congressional powers in regulating interstate commerce. Northern cities were transformed by the arrival of newcomers from the countryside, including free African Americans, and of immigrants from Ireland and Germany. Students next learn about the Second Great Awakening and how it contributed to an “Age of Reform,” which included the rise of the abolitionist and temperance movements, the push for prison and educational reform, and the demand for women’s rights. At the same time, art and literature flourished under the impact of Ralph Waldo Emerson and his belief in Transcendentalism. Students learn about the settlement of parts of Texas by Anglo-American settlers, the Texas Revolution, the doctrine of “Manifest Destiny,” the election of James Polk as President, the settlement of the Oregon controversy, the Mexican-American War, the Mexican Cession, the fate of the Mexicanos living on the territories annexed by the United States, and the California “Gold Rush.” They also learn about the roles of pioneer women and women’s rights in the West. Students consider how slavery, sectionalism, states’ rights, the struggle over the balance of power in Congress, and the election of Republican candidate Abraham Lincoln led to the outbreak of the Civil War in April 1861. Then they learn about the advantages held by the North and South at the beginning of the war, military strategies, key battles, the Emancipation Proclamation, the Northern victory, and the immediate consequences of the war. Excerpts from primary sources illustrate wartime experiences. Students learn about the struggles over the reconstruction of the South after the Civil War. They examine the Black Codes ; the impeachment of President Andrew Johnson; the 13th, 14th and 15th Amendments; the sharecroppers, Exodusters and “Buffalo Soldiers”; and the Ku Klux Klan. They also learn how rights extended to African Americans during the Reconstruction Era were suddenly taken away when Reconstruction ended in 1877. In an important postscript, students learn how Dr. Martin Luther King, Jr., and other Civil Rights leaders later overturned Southern “Jim Crow” laws and how Cesar Chavez similarly fought for the rights of Mexican-American migrant farmworkers. Students learn about America’s “Second Industrial Revolution” and the rise of the railroad, telephone, steel, oil, and electricity industries in the decades after the Civil War. They examine the foundations of economic growth and learn about the contributions of inventors like Thomas Edison, Alexander Graham Bell, and the Wright Brothers, including African-American inventors such as Madam Walker, Elijah McCoy, Jan Matzeliger and Garrett Morgan. Students look at the achievements and tactics of successful entrepreneurs such as Leland Stanford, Andrew Carnegie, John D. Rockefeller and J.P. Morgan, who combined technology and resources to transform American life. They examine the role of industry and technology at the Chicago World’s Fair in 1893, as well as the attempt to curb industrial monopolies with the Sherman Antitrust Act and other legislation. Students learn about the impact of industrialization on American workers, cities, and immigrants. They learn about the worsening of conditions for many industrial workers, and how workers responded by forming their own labor unions. Students also learn about the failures of striking workers in the Homestead Strike and during the Haymarket Riot. Next they turn to the impact of industrialization as people moved from the countryside to cities and an increasing number of immigrants arrived from Eastern and Southern Europe. Urbanization and immigration especially encouraged the rise of political machines and corrupt political bosses. These bosses provided services to immigrants in exchange for their votes. The “New Immigrants” especially faced bias and discrimination from “Nativists.” Immigrants from Asia faced special problems: in 1882, most immigration from China was cut off by the Chinese Exclusion Act. Students learn about the lifestyles of American Indians on the Great Plains, the Southwest and Far West. Then they learn how these lifestyles were changed by the Indian Wars, the reservation system, the reservation and boarding schools, and the Dawes Act. Indians lost most of their land, became confined to reservations, and saw their traditional cultures threatened in the name of progress. Students investigate the settlement of the Great Plains and Far West. They look at the push-and-pull factors that brought settlers to the West, including the discovery of precious metals, the completion of the transcontinental railroad, the massacre of the wild bison on the Great Plains, and the defeat of Indian tribes by the U.S. Army in the “Indian Wars” after the Civil War. Students learn about cattlemen and the “long drive,” the conflicts between ranchers and farmers over land use, and how farmers on the Great Plains adapted to arid conditions, enabling them to turn the Great Plains into vast producers of wheat. Students consider the cultural diversity of the American West and the question of the conservation of natural resources. Finally, students look at how farmers reacted to the decline in crop prices by organizing into Grange societies and later forming the Populist Party in the early 1890s. The “Omaha Platform” of 1892 included many far-reaching proposals that were later adopted: direct election of U.S. Senators, a secret ballot, a progressive income tax, initiative and referendum procedures, the eight-hour work day, and restrictions on immigration. In 1896, William Jennings Bryan was chosen as the Democratic and Populist candidate for President after giving his “Cross of Gold” speech. In his campaign, Bryan focused on “bimetallism”—the proposal to base money on silver as well as gold in order to raise prices. Bryan lost the election to William McKinley in a close contest. At the end of the book, students are asked to consider the general themes of E Pluribus Unum—liberty, growth and equality—in the context of what they have just learned about early American history. We offer free professional development for districts adopting our book. For workshops with innovative instructional strategies for using this resource, please contact our authorized providers of professional development, Steve Beasley or Sherry Owens of s3strategies, at (806) 407-5354.